Fourth Corner Exchange, ("Fourth Corner Exchange"), a Washington State organisation, is engaged in the business of providing an information service through which ("Members") can exchange goods and services within a Cooperative Economy, and maintaining a central account of those exchanges for the benefit of Members (the "Program"). The following states the terms under which an individual may participate in the Program. 1. COOPERATIVE ECONOMY: The mission of Fourth Corner Exchange is to create, encourage, develop and support the emerging Cooperative Economy as an alternative to the mainstream competitive economy, by maintaining an alternative currency and educating Members in its use within the Cooperative Economy. 2. MEMBERSHIP AND DUES: A signer of the Fourth Corner Exchange Membership Application agrees to participate in the Program pursuant to the terms and conditions of this Agreement. The signer will become a Member of the Fourth Corner Exchange ("Member") upon payment of a joining fee in the amount of the yearly dues ("Yearly Dues") and Fourth Corner's acceptance of the Membership Application. The joining fee will constitute the Yearly Dues for the first year of membership. The Member agrees to pay Yearly Dues for further years of membership in advance of each anniversary of Fourth Corner's acceptance of the Member's membership. Fourth Corner Exchange may in its sole discretion alter the amount of the Yearly Dues from time to time and shall notify the Member of the amount of such Yearly Dues thirty (30) days prior to the time the Yearly Dues are due. The joining fee and Yearly Dues are non-refundable. 3. NEW MEMBER COMMITMENTS: Member agrees to carry out the commitments incumbent on new Members as described on the Fourth Corner Exchange website before or immediately following becoming a new Member as prescribed on the website. 4. MEMBERSHIP INFORMATION: Information in a Member's profile, excluding the Members physical address, is available to all Members in the Program. The Member agrees that Fourth Corner Exchange may hold his or her details on its computer database and distribute to other Members of the Program those details relevant to the purpose of exchange. The Member agrees that Member's listing of goods and services offered or wanted may be distributed to all Members and potential Members of the Program. 5. 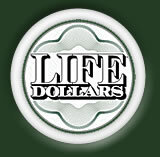 LIFE DOLLARS: The Member may give to or receive from other Members credit in the accepted Fourth Corner Exchange Program unit of currency called Life Dollars. A Life Dollar is the value given to one hour of someone's time at a basic living wage within their local community. These units are recorded in Fourth Corner Exchange's Program database. Each Member is given an account tracking his or her currency units. a. Only the Member can authorize the transfer of Life Dollars from his or her account to that of another. b. Although Members are not prohibited from exchanging Life Dollars for national currencies such as US Dollars, such exchanges may not be in alignment with our mission statement and are therefore not encouraged. c. Any exchange of units of Life Dollars for units of any other alternative currency must be approved by Fourth Corner Exchange in advance. This is possible, but must be supervised by Fourth Corner Exchange so as to protect Life Dollars from currency debasement. 7. NO NATIONAL CURRENCY: No national currency is deposited or issued in the Program. However, the Member may engage in any transaction on a part national currency, part Life Dollar basis, but only Life Dollars are recorded on Fourth Corner Exchange's Program database. a. All accounts start at zero, unless Fourth Corner Exchange gives partial credit to a Member for national currency received, which Fourth Corner Exchange may do from time to time in its sole and absolute discretion. A Member is not obliged to be in receipt of any credit before issuing another Member in the Program with credit from his or her account, subject to any limit that may be set by Fourth Corner Exchange in its sole and absolute discretion from time to time. b. If upon termination of the Member's participation in the Program the Member has an outstanding balance in his or her account, the Member must balance his or her account within sixty (60) days of termination of Member status. If upon termination of the Member's participation in the Program the Member has a positive account balance, the Member shall have sixty (60) days within which to accept goods and services sufficient to balance the Member's account. Any positive balance remaining after sixty (60) days shall be forfeited. Fourth Corner Exchange reserves the absolute right to satisfy any balance with payment in national currency. Notwithstanding the foregoing, in the event Fourth Corner Exchange determines that the reason for the Member's termination is for inappropriate conduct, which determination shall be made in Fourth Corner Exchange's sole and absolute discretion, the Member shall have no right to balance any positive account balance existing upon termination. c. Each member is entitled to know the balance and turnover of any other member of the Program's account. Fourth Corner Exchange may in its sole and absolute discretion publish from time to time the balances and turnovers of all accounts for members of the Program to view. d. No interest is charged or paid on account balances. This is one of the defining features of the Life Currency Cooperative Economy. 9. NO OBLIGATION TO TRADE OR DECLINE TO TRADE: No member is obligated to accept any particular invitation to trade, or to engage in any transaction whatsoever with other members of the Program. 10. DECLINE TO RECORD: Fourth Corner Exchange may decline to record a transaction, all or part of a member's profile, or any description of goods or services offered or wanted if such is considered by Fourth Corner Exchange in its sole and absolute discretion to be inappropriate for legal or other reasons. 11. NO WARRANTY: Fourth Corner Exchange publishes a list of the goods and services that members offer to or wish to receive from other members through the Program. Fourth Corner Exchange makes no warranty or undertaking expressed or implied concerning the goods and services offered in the Program, including without limitation any warranty of merchantability or fitness. Fourth Corner Exchange is not responsible for damages, including without limitation consequential damages, that a member may incur as a result of trading through the Program. Member will hold Fourth Corner Exchange harmless from any such claim arising from a trade in which Member is involved. a. It is the responsibility of each Member to ensure their listings on the Fourth Corner Exchange computer database are maintained and are up to date. Fourth Corner Exchange will delete or inactivate listings from its database that are deemed to be unreasonably out of date, at the sole and absolute discretion of Fourth Corner Exchange. b. Members agree to accept Life Dollars in payment or part payment for goods and services listed in the Fourth Corner Exchange database. Member goods and services listed for national currency only will be removed from the database. c. Member listings which contradict or are not in alignment with the vision and mission statements of Fourth Corner Exchange as a Cooperative Economy will be removed at the sole and absolute discretion of Fourth Corner Exchange. 13. RECORDING EXCHANGES: The Member agrees to record the exchange of Life Dollars with another Member within three (3) days of the completion of the exchange. 14. TAXES: All Member taxes are the sole responsibility of the Member. 15. NON-MEMBERS: Certain portions of the Program database are confidential and may not be viewed or used except by Members. In general, these are the portions of the database to which access can be obtained only through use of a Member's password. Non-members may not access the confidential portions of the computer database at any time. Allowing a non-member access to the confidential portions of the database may be grounds for termination of membership. 16. TERMINATION; DENY MEMBERSHIP: Fourth Corner Exchange may act on behalf of members in seeking explanation or satisfaction from a member whose activity is considered to be contrary to the interests of the Program. Fourth Corner Exchange may terminate a member's participation in the Program for any reason and at any time, including for delinquency in settling accounts with other members. Fourth Corner Exchange reserves the right to deny membership to any applicant without explanation. 17. RE-JOINING: A member may rejoin after an absence of membership. Any non-zero balance from their previous account may be carried forward to the new account at Fourth Corner Exchange's sole and absolute discretion. 18. ASSIGNMENT: Member status in the Program may not be assigned. 19. CHOICE OF LAW; VENUE: This Agreement will be governed by and construed and interpreted in accordance with the laws of the State of Washington, USA. Any action relating to this Agreement must be brought in a court of appropriate jurisdiction in Whatcom County, Washington, USA. 20. HEADINGS: Headings used in this Agreement have been included for convenience and ease of reference only, and will not in any manner influence the construction or interpretation of any provision of this Agreement. 21. SEVERABILITY: If any provision contained in this Agreement shall be adjudged invalid, illegal or unenforceable in any respect by a court of competent jurisdiction, the validity, legality and enforceability of the remaining provisions contained herein shall not in any way be affected or impaired thereby. 22. AMENDMENT: The provisions of this Membership Agreement may be modified from time to time by Fourth Corner Exchange. Any such modification will apply to all members. Modifications may include the levy of fees in addition to the Yearly Dues. 23. RULES AND REGULATIONS: Fourth Corner Exchange may from time to time establish reasonable rules and regulations regarding the Program which shall be binding upon all members. COPYRIGHT © 2004-2015 Fourth Corner Exchange. ALL RIGHTS RESERVED.